Samson Ropes is one of the largest rope manufacturers in the world and they have over 100 years of experience making ropes for the most demanding jobs. Samson has been a leader in developing ropes for tree rigging and climbing and Samson rigging lines like Stable Braid are our best sellers here at WesSpur. In addition to the strong, smooth-handling Stable Braid, Samson Arbor-Plex and Tree-Master are durable, strong, and reliable rigging lines that bring high-strength with a low cost. For winch lines on a chipper, ATV, or Portable Winch nothing beats the incredible cable-replacing AmSteel-Blue. Samson Stable Braid is our best-selling rigging lines. High-strength, low-stretch, and works great with arborist blocks and lowering devices. A great rope for rigging, especially in a false crotch rigging system. One of the few rigging lines which works equally well in natural and false crotch rigging. 12-strand construction is durable, and resists snagging. Available as a climbing line. Nystron is a double braid rope with a nylon core for great shock mitigation and increased elasticity - perfect for heavy rigging and negative blocking when high demands will be placed on the rope. Tenex Two End Carrier (TEC) is an easily-spliced 12-strand rope that is perfect for tree rigging slings. 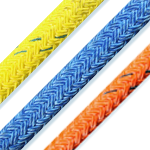 Tenex (Single Carrier) is an easily-spliced 12-strand rope that is most commonly used for arborist winch lines. Tree-Master is a new favorite rigging line from Samson. This 3-strand rope is a hard lay which makes it exceptionally strong and very durable. Available in 1/2”, 5/8” and 3/4”. Pro-Master is a soft-lay 3-strand rigging line available at great prices. This rope is good for natural crotch rigging and comes in 1/2”, 5/8”, 3/4”, and 7/8” diameters. Looking for an alternative to steel cable for your winch line? AmSteel-Blue is stronger than steel and easier to work with! A favorite for chipper winch lines.